The Cause and Effect Sutra has been spread extensively for a long time. 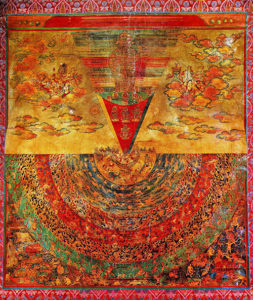 During the Dharma Vanishing Era, it promotes good social order by educating people about the importance of doing good deeds and obtaining merits. It also promotes a stable society, eliminating evils and enhancing the self-control of beings. Anyone who propagates this sutra widely will obtain immeasurable merits. Your present circumstances give a clear demonstration. How can one eliminate one’s bad Karma? Eradicating the roots of the Three Poisons is the answer. Can gain quick effects that are highly praised by the masses. Ends the sufferings from Karmic causes for those who read and follow it. And listen to the Cause and Effect Sutra about your past, present and future lives. Neither dismiss nor forget Buddha’s true words. What is the cause of holding a high government office in this life? It is the consequence of propagating virtuous dharma in a previous life. What is the cause of having good fortune and wealth in this life? It is the consequence of listening and practicing Buddhist dharma in a previous life. What is the cause of having good health and long life? It is the consequence for those who practiced esoteric dharma and strived for enlightenment. What is the cause of an easy and peaceful life? It is the consequence of performing virtuous and moral deeds in every past life. What is the cause of being able to live in affluence, well fed and dressed in fine clothes? It is the consequence of building temples and making offerings to the Buddha. What is the cause of being able to travel by plane and car? It is the consequence of donating money for the construction of temples. What is the cause of being able to wear silk and satin? It is the consequence of decorating Buddha statues with gold for three past lives. What is the cause of living in luxurious high-rise buildings? It is the consequence of donating rice to the “God of Earth Temple” in a previous life. What is the cause of having bright eyes in the present life? It is the consequence of contributing lamp oil to light the Buddha’s lamp in a previous life. What is the cause of a dignified appearance? It is the consequence of offering flowers to the Buddha in a previous life. What is the cause of having both parents alive? It is the consequence of paying respect to Buddhist worshipers in a previous life. What is the cause of having talented descendants? It is the consequence of worshiping and making offerings to the Buddha. What is the cause of having incurable diseases in this life? It is the consequence of destroying a temple that resulted in bad karma. What is the cause of a tragic death in this life? It is the consequence of killing sentient beings in a previous life. What is the cause of having bad luck for your whole life? It is the consequence of disrespecting the Buddha in a previous life. What is the cause of lacking food and clothing? It is the consequence of reluctance to donate even a penny to the Buddha. What is the cause of not being able to bring up a child well? It is the consequence of not performing good deeds and having bad karma. What is the cause of having no children in this life? It is the consequence of committing all sorts of evil deeds in a previous life. What is the cause of an early death? It is the consequence of cruelty and killing in a previous life. What is the cause of blindness in this life? It is the consequence of ignoring the Buddha in a previous life. What is the cause of being born as a dog or pig in this life? It is the consequence of cheating and harming others in a previous life. What is the cause of having many illnesses in this life? What is the cause of missing limbs in this life? It is the consequence of committing robbery in a previous life. What is the cause of being born as a horse or cow in this life? It is the consequence of not repaying debts in a previous life. What is the cause of being humpbacked in this life? It is the consequence of teasing Buddhist worshipers in a previous life. What is the cause of having harelip in this life? It is the consequence of spreading gossip in a previous life. What is the cause of being deaf and dumb in this life? It is the consequence of cursing others in a previous life. What is the cause of being imprisoned in this life? It is the consequence of committing murder for money in a previous life. What is the cause of a destitute life? It is the consequence of being unwilling to donate to others in a previous life. What is the cause of a lonely and helpless life? It is the consequence of evil plots against others in a previous life. What is the cause of a stinking body? It is the consequence of contaminating the Buddha’s body in a previous life. What is the cause of being haunted by evil spirits? It is the consequence of harming others to benefit oneself in a previous life. What is the cause of being struck by thunder and burned by fire? It is the consequence of slandering monks and nuns in a previous life. Who says there is no retribution of virtuous and sinful deeds? Richness and nobility can be clearly distinguished from poverty and lowliness. Retaining merits will lead to good fortune, high ranking and longevity. Building a God of Earth Temple will benefit the descendants. It will never be attained without cultivation in previous lives. Their family will prosper for generations. They will be highly respected by others in a future life. They will be blessed and born with merits in a future life. The retribution of virtuous and sinful deeds provides the proof. Which help to avoid suffering in hell. Build a God of Earth Temple in your present life. It is more effective than spending millions of dollars elsewhere.